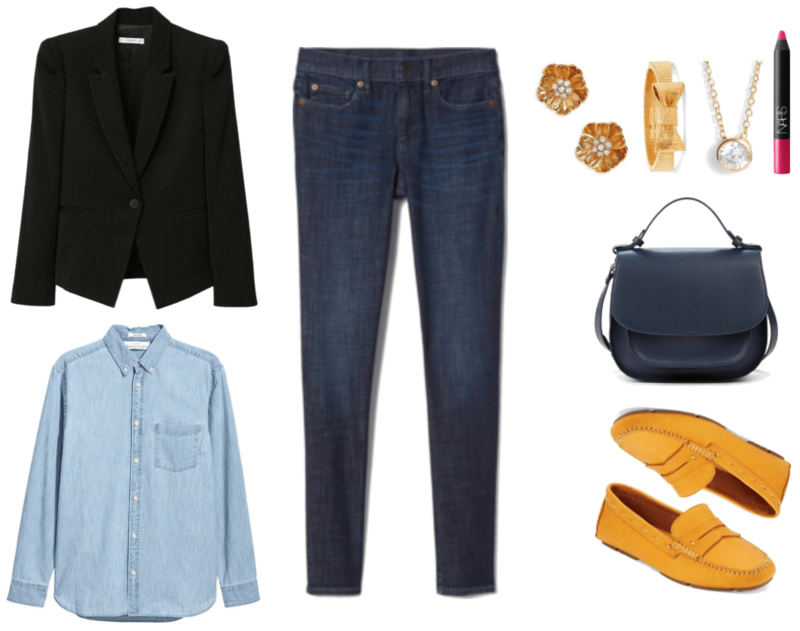 Denim often gets a bad rap for being too casual for work — even in business casual workplaces. However, fashion keeps evolving, and with it, so do ideas of what is appropriate to wear in professional settings. Stay away from rips and distressed details: Unless your workplace is very casual, it’s a good idea to stick to jeans that look new, clean, and crisp when wearing jeans to work. Otherwise, you run the risk of looking sloppy rather than put-together. Keep it classic: When in doubt, choose timeless, streamlined silhouettes that are always in style; think skinny or slim-leg jeans, denim pencil skirts, etc. This will make your look appear fashion-forward and intentional, rather than over-the-top. The one exception is if you work in a creative setting, such as fashion, where it is expected that your work look will be trendy and of-the-moment. Watch out for embellishments: While embellishments such as patches, rhinestones, and sequins might seem like a fun way to up the formal factor of your look, it’s usually a good idea to avoid them when working — especially if they go across the seat/rear area. Doing so will not only prevent your outfit from venturing into overdone territory, but is also much more polished-looking overall. Now that all of that has been said, keep scrolling to see how to wear jeans at work! This outfit revolves around the classic skinny-jeans-and-blazer combo, making it a perfect choice for those who are new to the idea of wearing denim to work. For a sleek and professional look, stick with dark-wash jeans and a blazer in a dark, neutral color and simple cut, as I did here. While you could style this pairing with any professional-looking top (or perhaps even a t-shirt, depending on how casual your workplace is), I chose to go a little more daring and add a denim shirt. And, while the idea of wearing a Canadian tuxedo to work might seem intimidating, all that you really need to keep in mind is: 1) your top should be a very different color from your bottoms; and 2) just like your bottoms, your top should be streamlined and classic. For jewelry, I chose these fun Poppy-shaped earrings and cute bow bangle, along with a sophisticated pendant necklace. I also chose a timeless cross-body bag in a shade of midnight-blue for a dose of coolness. Finally, because the outfit is monochromatic, I decided to jazz things up a little and round out the look with a pair of bright yellow driving moccasins, along with a Nars lip pencil in an upbeat fuchsia shade. When paired with soft, pretty basics, such as a gorgeous peach-pink sweater and beige block-heel pumps, light-wash slim-fit boyfriend jeans go from casual to work-ready. Add some dainty jewelry — think delicate layered bracelets, a multi-strand lariat necklace, a signet ring, a feminine watch, and double-pearl earrings — for a beautiful and chic aesthetic that’s understatedly trendy. Put your hair back in either a sleek ponytail or a half-ponytail using a Gucci-inspired hair clip for an extra touch of polish. Lastly, stow away your essentials in a faux-suede tote, whose lovely dusty-pink color contrasts subtly with the colors of the sweater and heels. If your style is a little bit retro, then you’ll love this ‘70s-inspired outfit! To get it, put on a cropped v-neck sweater and a high-waisted midi denim pencil skirt; the tie-waist detail on this one is great for emphasizing an hourglass figure! Luxe cashmere-blend tights are sure to keep your legs warm in cooler temperatures, and you can never go wrong with a pair of classic tan leather knee-high boots. 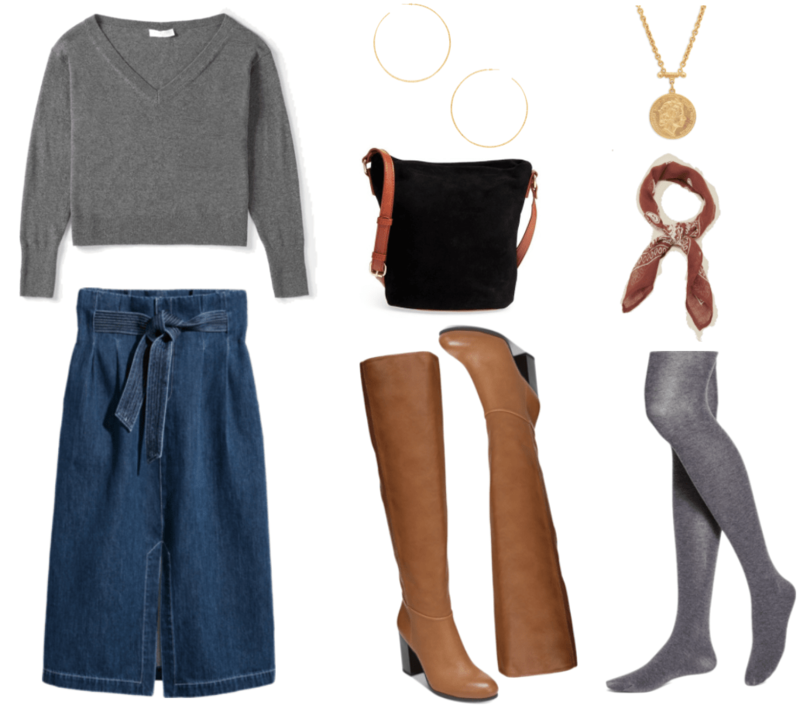 Add a slouchy suede cross-body bag that is in keeping with the slightly boho vibe of this look, as well as a pair of skinny hoop earrings and a cool coin necklace. They’re great ways to add visual interest. Tie a printed bandana around your neck, your hair, or even the strap of your bag for a classy way to complete this vintage-inspired outfit. Do you ever wear denim to work? If so, how do you style it so that it looks professional? Do you have any additional tips for wearing denim in a professional setting?